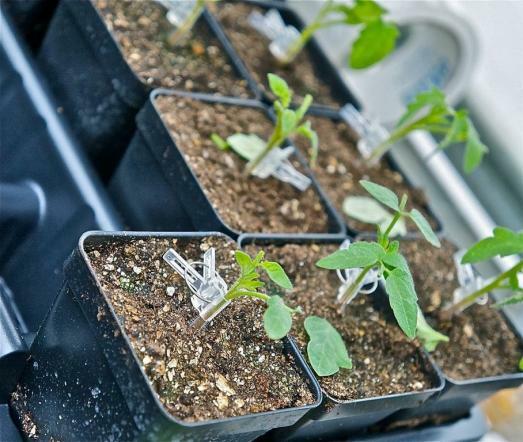 Beware, for when you enter our greenhouses here at Gardens of Eagan, you just might be knocked over by wiley tomato plants, roots crawling across tables, tangled in knots, blindly searching for soil. You must be careful or you could drown in a sea of unkempt lettuce, bitter because it never had a chance to find a home in the ground. And you must watch out for the “Slow Bolt” cilantro, acting against its better nature and reaching up up up for the ever-shaded sun. I fear a riot may soon break out between the brassicas and solanums: broccoli and peppers wrestling each other, attempting to win a spot as one of the first flats out of the door, fighting for a spot on one the wagons we use to prepare the plants for their lives in the soil, tightening their root systems to prove they deserve space in the fields. I tend to think of farms as pastoral: wide-open fields crawling with life; rich, loamy soil speckled with the green of young, adolescent plants; exhausted, dirty farmers ambling home for a meal and momentary rest. Instead, despite good crop planning, excellent seeding, perfect greenhouse conditions, and able-bodied farmers, our fields remain for the most part empty. This season, Minnesota has been bombarded with rain – torrential downpours swooping in for days and sometimes weeks at a time, leaving fields soaked with water and unworkable, while also blowing down warmer temperatures, stunting plant growth. By now, our first kale would be picked and three successions of cucumbers planted. We have done all we can: fighting exhaustively to beat the endless wind and rain, racing to the fields to plow and turn the soil, throwing plants in the ground and hoping that another frost will not come and eat away at tender new growth. Though we plant as the sun (or rather the rain) allows, we, like the plants, must pass days cooped up in the greenhouses, clawing through mounds of potting soil and slicing through thick, unmoving air. What can you do when it rains, when the temperatures do not climb above 65 degrees on most days, when the soil is so waterlogged that your fields look like ponds? I feel like I’ve been hungry for weeks. The current farmer’s markets resemble those of early spring –tables piled high with rhubarb and asparagus, tents lined with plant starts hoping to find land soon – though the calendar has already turned to June, and I no longer want to sustain myself on pea shoots and dried beets from October. I am not only a hungry customer, but an eager and energized farmer, as well. These terrible farming conditions make me realize that there is never job security in agriculture, and I am reminded of how lucky I am to have my current position. Fortunately, Gardens of Eagan allows for an environment of stability: our two acres of greenhouse space keep us busy most days and our preparations for the fields – as we are highly optimistic farmers who believe that it will stop raining someday – fill in the gaps as they can. Recently, there have been few days when I blinked back beads of sweat from my eyelashes and felt them roll slowly down my cheeks. My pants rarely hang heavy at the days end, legs rolled up catching clumps of lost soil, exposing my pale, pre-summer legs. Come five o’clock, my carpool crew and I have only once joyfully driven down the country roads of Northfield, arms hanging out open windows beckoning in cooled, crisp air. In the pockets of sun, we rejoice and work our bodies until our backs beg us to stop. But when the sky falls out again, for the fourteenth day in a row, our shoulders slump in disappointment, and we always work just as hard. Molly adding soil amendment to tomato potsKeeping us busy during this continual weather confusion are our diva-liscious-grafted-baby-prized-possession tomatoes. 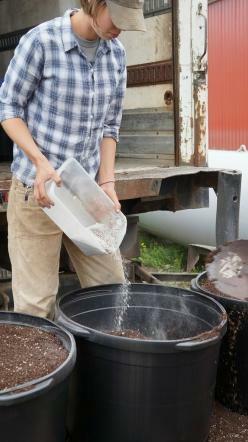 This year, because some of our land is still transitional (not completely certified organic), our tomato plants with never sink their roots into land outside, but will float, instead, in twenty-five gallon pots filled with a carefully crafted concoction of composted manure, soil amendments, and peat moss. 960 pots, total, fit into two of our nine greenhouse bays, which is a lot of pots. 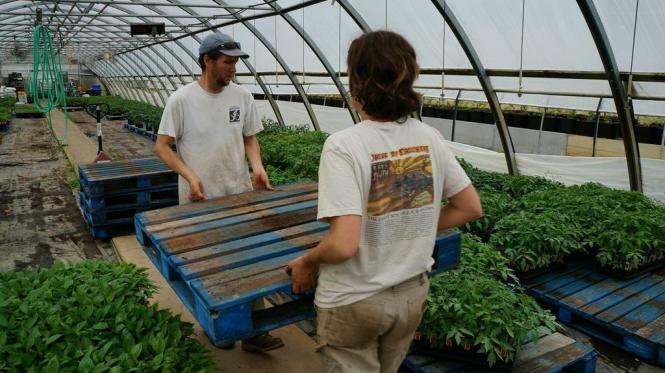 A few mornings each week, we shovel several tons of potting soil into round, black plastic planted, beat back the wind, load them onto our delivery truck, cry to the skies to hold onto the rain, and line them up, as perfectly straight as possible, in one of two greenhouse spaces. The work is rarely excruciating, though Molly, my usual shoveling partner, and I do complain about sore biceps and aching shoulders. As a small crew of four, we relish our time outside, building a small part of the farm empire, and knowing soon our labor will bear sweet glorious globes of gold and ruby fruit. Once placed in their three carefully spaced rows, the new tomato penthouses prepare to receive the greenhouse divas. 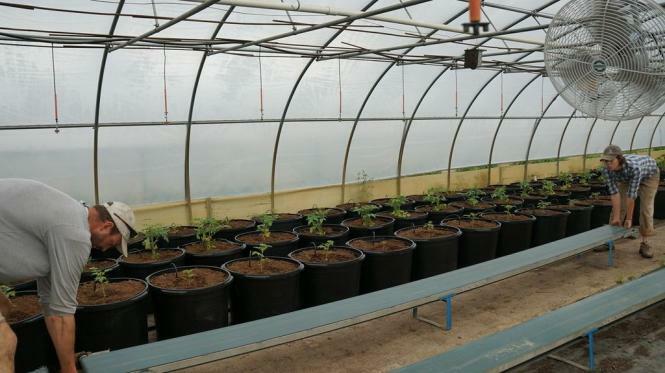 First, we equip the pots with a personal irrigation system – a thin black tube (technically called “spaghetti” tubing) connected to a larger lay flat (known also as orchard tubing). 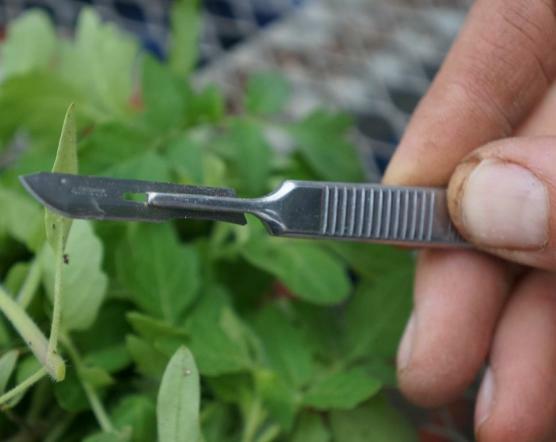 The intricate watering method soaks only the tomato’s roots and allows the leaves to remain dry, avoiding pesky fungal diseases that commonly affect our favorite nightshades and lead to early death. And at this point, we want to do anything and everything possible to keep our babies alive. More hands touch tomatoes than any other plant on the farm and no other organisms receive more lush living conditions. Not only are they transplanted many times, they also go through a grueling grafting process, a surgery from which few return whole. Locked up in the greenhouse for hours at a time snipping, securing, and supporting, Molly, guided by greenhouse manager Eric, has invested many days in ensuring our tomatoes are happy and healthy plants. And those that do survive go on to feast freely in their meticulously made homes. It is through this torturous rain that we have been so able to prepare and tend to our young crop of greenhouse grown plants. Not only the tomatoes, but also our peppers and cucumbers and rosemary and basil. The constant downpours and high winds push us indoors, into the greenhouse and the pack shed, the office and the workshop. But our forty and fifty hour weeks would not buzz by, if not for the endless needs of young, eager plants waiting, just as we are, for the soil to dry out and the tractors to swing by and sweep them off their feet. Katie Willis is a native of Birmingham, Alabama, where she grew up with NASCAR, twangs and drawls, and lots of fried okra. Her farming career began on an urban farm in Birmingham, where she ate arugula and swiss chard for the first time in her life. Eventually she moved to rural New York to work with chickens, goats, and really strong women. She enjoys a rowdy round of arm wrestling, discussions on all things related to heternormativity, seasonal food preservation, long bike rides, Toni Morrison, and ice-cold beer. Katie recently moved to the Twin Cities with her girlfriend, Lily. They live in Powderhorn and eat lots of butter, maple syrup, and frozen kale. 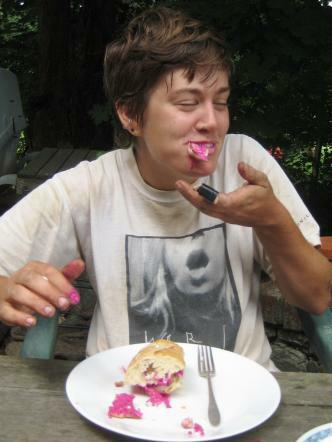 This year marks her seventh season with soil underneath her fingernails and a bounty in her fridge. Her last post for SGT was Farm Journal: Laying New Roots.